Oh, please. You’d think that an administration that promised new approaches would make some tiny effort to think outside the prohibition box. But never once in Tillerson’s comments or those of his colleague Homeland Security Secretary John Kelly did a new idea appear. Never once did they hint at any effort to consider the success of other nations where various types of legalization and regulation have greatly reduced drug problems. Take, for example, the success of states like Colorado now in its fifth year of marijuana legalization. Sales of the legal herb generated tax revenues exceeding $150 million between January and October 2016, $50 million of which the state is using to pump up its school systems. Significant shares of this revenue stream will support improved drug treatment, drug education programs, and various projects targeting at-risk populations. All these expenditures help increase education, job skills, and opportunity for persons who might otherwise fall victim to substance abuse. Yes, Americans are the market. But instead of devoting resources to learning more about why Americans are uniquely prone to drug use and abuse, outdated policies continue to treat Americans as children to be scolded and punished. This attitude helps foster voters’ disgust with government. Punishment has become increasingly more severe as subsequent generations of policymakers have embraced the government-as-nanny model. Any incremental step away from prohibition has come wrapped in controversy, implemented only in states where the voice of reason has a chance to be heard. Now with the Trump Administration and its appointment of Jeff Sessions as head of the Justice Department, we face the prospect of a full-bore return to the good old failed policies of the past. While our nation’s drug warriors lament that such an approach would lead to higher use rates among the young and greater ease of availability would increase use rates, the fact in Portugal is that youth aren’t using more, adults are using slightly less, the rates of HIV and Hep C infection are down, and – hear this – hardly anyone dies of overdose. Compare that to the alarming rise in U. S. deaths from opiates which more than tripled between 2010 and 2015. 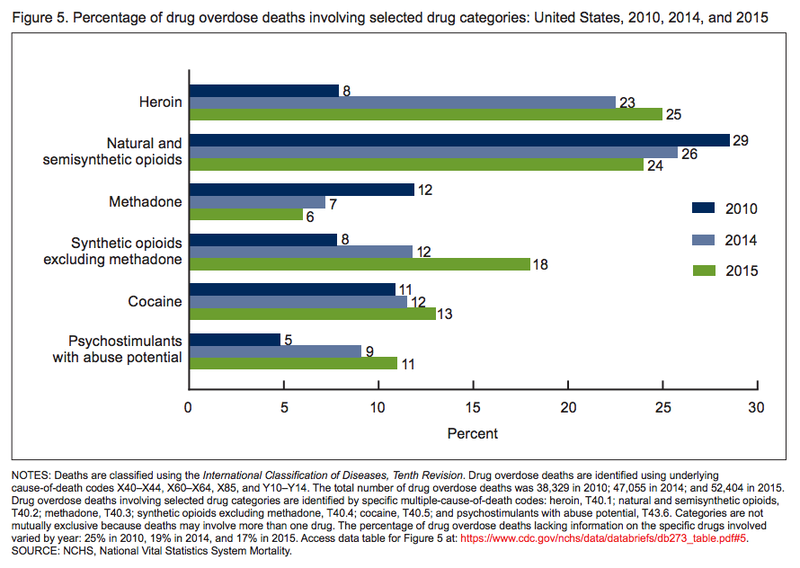 Drug overdose is the leading cause of accidental death in the US, with 52,404 lethal drug overdoses in 2015. Opioid addiction is driving this epidemic, with 20,101 overdose deaths related to prescription pain relievers, and 12,990 overdose deaths related to heroin. It’s way past time to face reality: people are going to use drugs. As far back as we can peer into human history, people have consumed everything from beer to cannabis to opium to hallucinogens. These practices are part of who we are, part of our religions, part of our ability to think outside or within ourselves. Legitimate questions await answers about why various types of drug use throughout the millennia have transformed into today’s raging torrent of human suffering, but we’re not devoting any resources to answer those questions. Have the pressures of our fast-paced modern age forced us to seek refuge in intoxication? Is our multicultural society at fault in erasing old customs and rites of passage that could help us confront our existential crisis? Have the conveniences of our technological age created too much leisure time? What is the impact of a pharmaceutical industry’s marketing campaign flooding us with ads suggesting that the solution to every human ill is a drug? We should have learned a hundred years ago that criminalizing a popular intoxicant only creates bigger problems. 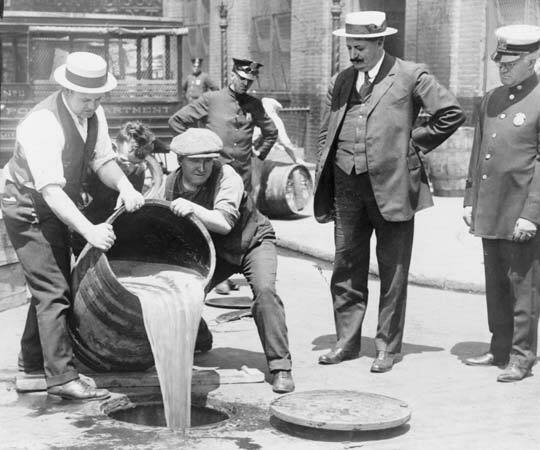 Those who championed alcohol prohibition wanted to stamp out drunkenness. The blissful concept assumed that if alcohol were made illegal and its producers and users criminalized, everyone would simply stop drinking. Far from it. For their trouble in passing the Eighteenth Amendment, the “dry” crusaders found their cities overrun by heavily armed criminals fighting over territory. People flaunted the law, patronizing highly popular speakeasies where drinking served as joyous rebellion against overweening authority. No matter how many barrels of liquor were spilled into public gutters, ever more enterprising moonshiners set up shop in hidden hollows. It took just over fourteen years for prohibition fervor to sour. Amendment Twenty reversed it in 1933. Sadly, it seems little of this lesson actually sank in. Prohibition policies continue to frame our national approach to substance use and abuse, siphoning money into hit squads of heavily armed urban police and burgeoning prisons instead of desperately needed research and treatment of addiction. Reality is that prohibition does nothing to reduce the market for drugs, but it does create a thriving underworld where dealers make huge profits. Stamp out every drug producer/dealer in the nation and tomorrow another crop will rise to the surface. Among the poor, especially those in marginal economies of Mexico and other Latin American countries, the potential benefits far outweigh the risks. Our inner city youth’s only hope of achieving the American dream seems to lie in the profitable drug trade. It’s about supply and demand. The economics of prohibition can’t be overstated. Trade in illegal drugs generates so much profit that gangs can afford all the expensive weapons they might ever want. The spiraling up of urban warfare now involves military gear and tactics among the police and armor-piercing bullets in automatic weapons carried by adolescent criminals. The payoff comes in fancy cars, jewelry, and a lifestyle not achievable by legal means. Tax free. A war on drugs is, after all, a war on our people, with rising collateral damage to our cities, institutions, and most of all, innocent bystanders. a militarized police force versus friendly neighborhood police to protect and serve. our ever-growing investment in prisons versus a renewed investment in schools, mental health care, and state-of-the-art addiction treatment centers. American citizens treated as children by government deciding what they can do in their personal lives versus each person responsible for his/her welfare. Want to be homeless, die in a ditch? Go ahead. Ask for help, we’ll be there for you. overdose of drugs like heroin often resulting from zero information about purity or strength versus a regulated market that includes labeling for purity and precautions about use. 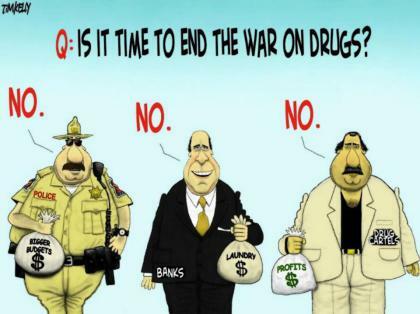 There are no upsides to the drug war. By any tally, this approach has been an enormous policy fiasco partly responsible for the decline of inner cities and disrespect for government in general. Government has never bothered to assess the effectiveness of its policies. No one can cite data showing that getting tough on drug traders and users has reduced supply or demand. Indeed, judging by the rhetoric of our newest batch of politicos and the news flowing to our ears and eyes on a daily basis, we can say with certainty that drug prohibition continues to be an abysmal failure. This entry was posted in American Culture, Economics, Morality, social problems, Uncategorized and tagged addiction, alcohol, drug cartels, drug dealers, drug smugglers, drug treatment, drug war, drugs, gangs, inner cities, legalization, prison industrial complex, prohibition, substance abuse, the great experiment on May 20, 2017 by Denele Campbell.